Alchemist Piano Studio is on 701 Byrne street.Enter through the “piano gate”. PIANO LESSONS in Houston Heights. Now enrolling! Studio is located on 701 Byrne street (77009) in the Woodland Heights. Beautiful place for students to learn. Alchemist Piano Theatre develops piano skills, confidence and creativity in musicians ages 7 and up. Every APT student is unique. Each student develops their own repertoire and musical style using various musical formulae for individual experimentations and explorations. LORETA KOVACIC is an experienced teacher, with a Doctorate degree in Music, also known as the “Alchemist”, the one who experiments and turns your piano class into a golden experience. As a teacher, Ms. Loreta is eclectic in her choice of music and focused on inspiring her students to be creative thinkers and artists, not just piano players. Students need to practice at home every day a minimum of 30 minutes. Learning how to play the piano is an artistic experience, but it requires discipline and work at home. "Loreta Kovacic is an inspiring teacher who encourages free thinking and creative independence", G. Key, mother of a Alchemist Piano student Eli. Ms. Loreta engages her students through a variety of methods and skills such as music theory, composition, piano technique, sight-reading, utilizing musical concepts, sight singing or solfeggio, songwriting, improvisation and performance. Sign up for piano lessons for a minimum of one semester to get started on your own unique “Alchemist PianoTheatre” journey. There will be joy, discovery, lots of learning and a few challenges. Inside the Alchemist Piano Theatre. 30 minute lesson individual cost is $ 45, monthly tuition is $ 180. Extra $ 40 is added to each semester's tuition for your registration and materials fee. All students pay tuition in one payment at the beginning of each semester. SEMESTER STARTS on the second week of public school schedule and ends one week before the end of semester, a total of FIVE months in the SPRING and FOUR months in the FALL semester. There is an average total of 20 lessons in Spring semester, or 16 lessons in Fall semester, including the final performance. Performance venues include: Lights in the Heights Christmas Concert, Heights Women Club, Rice University, Discovery Green stage, etc. 1) Students are required to bring their music and materials to class. This is very important for consistency and learning. Please include student’s piano books in their school bags on the day of their piano lessons. 2) Alchemist piano policy does not include any make up lessons. Your tuition secures your time slot, which is always there just for you.. Make up lessons are very difficult to schedule due to the Alchemist’s busy teaching and performance schedule. 3) Each student is required to play the piano every day at least 30 minutes. Students cannot improve without this daily commitment. For beginners it is best to take a 30 minute lesson weekly and for intermediate students (ages 10 and up) it is best to take a 45 minute to an hour lesson weekly. 4) Each student must have a piano at home or an access to a piano daily. Beginners can practice on an electric keyboard with a weighted key action but after three or four years, they need to switch to an acoustic piano. 5) Students need to listen to music, and go to hear live performances. There are many free concerts in Houston. HAVE A GREAT AND MUSICAL SEMESTER! Good starting age to study is when a child turns 7. This is not a rule: many musicians started playing very early or very late in life. However it is made clear that along with inspiration, there must be perspiration: to be successful – students are required to practice a minimum of 30 minutes per day. Loreta believes in magical power of music as well as challenging her students. Twice a year, student concerts are scheduled at a variety of venues in Houston. The choice of music performed is very eclectic, ranging from Beethoven to Beatles as well as current artists. Students are exposed to all styles of music and find their own interests within them. Loreta’s students have continued their studies at HSPVA, Oberlin Conservatory and Universities and Music Schools around the World. Dr. Kovacic holds a Bachelor’s degree from Zagreb Music Conservatory in Croatia, and a Doctorate Degree in Music from Rice U. in Houston. She builds her style on European lineage of dedicated piano teachers. Loreta is active as a performing artist and a composer as well. She is a Grammy nominated children’s music composer and Carnegie Hall soloist. Her music has been played on the International Space Station. It is also available on Amazon and Youtube. Here is Alchemist Piano student Jordan performing at Discovery Green in Houston. Her interest is in musical theatre, singing and acting, so her piano style gravitates towards show tunes. She develops her own arrangements of Broadway musicals. She is a great performer and artist. As I am laying here on my hospital bed in the middle of what used to be my living room, waiting for the old pelvis bones to heel, I reflect about my “Alchemist Piano” studio, past and present. As the new studio is almost finished, I look back at 23 great years of my studio’s esoteric yet blooming business dedicated entirely to the Musical Arts. It started as a modest piano studio, growing through time into a recognized music studio with an added original musical theatre for children, the Alchemist Piano Theatre, non-profit organization. The field of Music is such a wide open road, full of hidden treasures and fantastic discoveries…it’s very similar to Alchemy or, dare I say, Science. Well, it was a good word that I picked, because I still love it today, after 23 years of performance, composition and teaching as “the Alchemist”. I also love all the mysticism that surrounds the word, the colors, the imagery, words like “philosopher’s stone”, the healing crystals, the elixirs, all that Alchemical symbolism, the path of discovery, healing and learning... I have the word “Alchemist” written with gold letters as an entrance to my studio and inside my studio there are many objects that evoke the feel of the word: the golden owl, the planets, the moon and the sun, daily meditations, the shining crystal-like hanging sculpture by my favorite artist, Hana Hillerova, etc. Even my artistic endeavors somehow manage to evoke those alchemical dreams…In recent years I especially remember my original accompaniment of Georges Melies’s “Voyage to the Moon” and other alchemy related silent shorts that I hand picked from his amazing huge opus. The poster was made by the venue, Discovery Green in Houston, showing the famous picture of the moon and the rocket getting stuck in the moon’s eye. Everyone recognizes that image, and I just love it. I can’t believe how much I love that nickname, the Alchemist, after all these years. On second thought, it does make sense, because I think that any nickname that you make up for yourself is going to work better for you then the one given to you by others. I was named “Sovuljaga” or the “Ugly Owl” when I was in grade school, name given to me by my arch nemeses. I would have preferred just “owl”, because I really do love owls. They are a symbol of wisdom. My alma mater Rice University’s symbol is an owl. How appropriate! In more recent years I was named “Doc”, short for “Doctor” by my friend Duane, Houston’s public radio KPFT 90.1 manager. I like that name, it’s cute, but still, he only named me that because one time when he interviewed me I told him not to call me Doctor Kovacic. I prefer to be called by my name or the nickname I gave myself, the “Alchemist”. We musicians are alchemists because we work in the realm of the invisible which then brings us peace and joy in the visible world. Dominus tecum. Peace. Alchemist Piano student Jordan and Dr. Loreta Kovacic at SugarHill studio recording session. (Recording "Pirate Girl", new APT song) I give my students opportunities to participate in creative process of recording music. 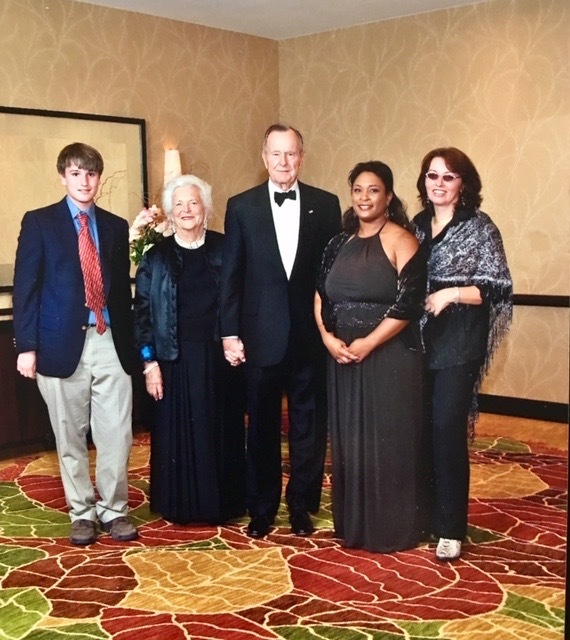 Performing for president Bush in Houston. With my piano student Jason Miller. I open performance opportunities to my students.